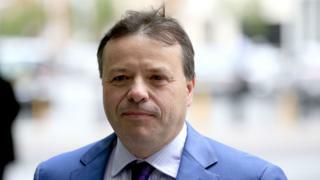 Pro-Brexit campaign group Leave.EU and an insurance company owned by its benefactor Arron Banks face total fines of PS135, 000 over breaches of data laws. It follows an Information Commissioner investigation into the misuse of personal data by political campaigns. The report says more than a million emails sent to Leave.EU readers included marketing for the Eldon Insurance firm’s GoSkippy services. Mr Banks protected himself on Twitter after the report’s release.